NEW YORK, NY – Donald J. Trump for President, Inc. launched PromisesKept.com, designed to document all of President Trump’s accomplishments in office and to counter the errors and omissions of the mainstream media, which distort, underreport, and lie about the President’s remarkable record since taking office. Presented in a timeline and catalogued by issue, PromisesKept.com is an active reference tool for President Trump’s mounting record of accomplishments throughout his term in office to date, including bills signed into law, Executive Orders, policy proposals, and more. 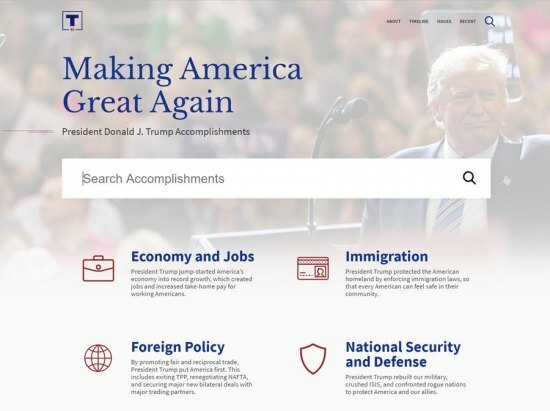 “We are happy to announce the launch of PromisesKept.com this evening,” said Brad Parscale, Campaign Manager for Donald J. Trump for President, Inc. “This repository will serve as a robust record of the Trump Administration and its growing portfolio of accomplishments. It’s a shame that such a platform is even necessary to overcome the errors and omissions reporting by the mainstream media – full of distortions, underreporting, and lies – but we are pleased to present such a record of achievement by President Trump nonetheless,” he concluded. “It’s fitting to launch PromisesKept.com as we mark the first 500 days of President Trump’s first term in office, during which the President has already fulfilled so many promises with record-breaking success in job creation, the economy, trade, national security, and so much more,” said Lara Trump, Senior Advisor to Donald J. Trump for President, Inc. “We are proud to offer this platform of the true and complete record of President Donald Trump, and we are also especially proud of what he has accomplished for the hard working men and women of America thus far. There’s plenty more to come!” she added.